I got the warp finished (I thought) and started weaving. The goal was to make a nice tea towel (or four). I also wanted to get my beating even and not so hard. I'm not making a rug here. The color in the photos is very bad, by the way. The yarn is pale blue and white in reality. This is the pattern I chose to use. Here is how it started. I used the green just to get my ends even. I thought it was looking a little like gauze instead of like a towel. Decided to cut off the first few inches as a sample and washed it. It's beautiful gauze. Just lovely stuff with a nice drape and everything. BUT not what I wanted, even after a wet finish. So I went down two sizes in the reed and resleyed. I'm much closer now and I think the wet finish will do the trick. It might end up being a table runner as it is somewhat narrower now than I planned. But then it might make a nice napkin or something. Live and learn. I'm going to finish it whatever it turns out to be. I'll post pictures of the closer to a towel weaving next week or so. Yeah, with me it's either feast or famine on this blog. But I have been busy. I'm spinning this on my Eleanor, the Symphony. 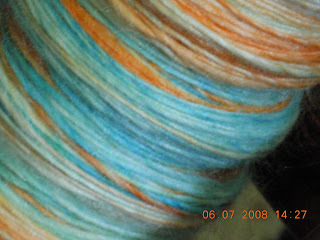 It's from Spunky Eclectic and I think the colorway was called something like Orange Juice at Dawn. Anyway, it's a nice blend of merino and silk and it was on sale. Not my normal choice of colors at all but I guess the question should really be what is normal? and the basket of split roving wound up in little nests just waiting to be spun. Some may wonder how I attached that mirror to the Sonata. Well, I tied it on with a bit of twine. just under one of the maidens. 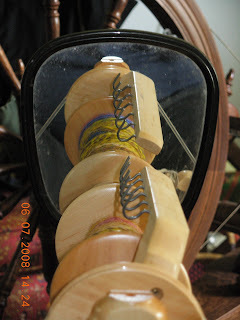 To change bobbins, I tilt the mirror to the side a little until it clears the end and just snap the bobbin up and out. The new one goes in the same way and the mirror is returned to it's upright position. I may or may not leave it on here. 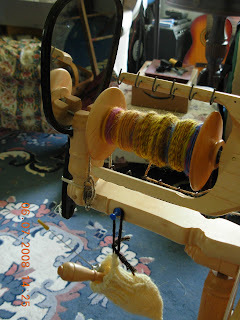 I have to say it does make it easier to see what is happening at the close end of the bobbin as I spin. When the Northern Neck Spinners and Weavers On-Line Group got together for a Fleece to Shawl Demonstration at the last Farmer's Market, I learned a new trick -- Thank you Judy! I was beginning to lament the wonderfully soft, beautifully colored Grey merino fleece that I bought because while my early attempts to wash it worked pretty well, I was having difficulty getting a smooth yarn when I combed or carded it. The yarn is okay but very neppy which I don't particularly like. 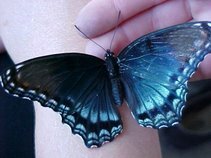 It's very soft and the color is exactly what I wanted, but it was bumpy.... 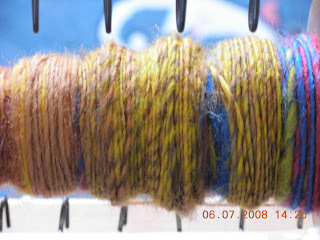 I was almost resigned to just spinning bumpy yarn. Then Judy introduced me (and the other ladies) to flicking the locks. 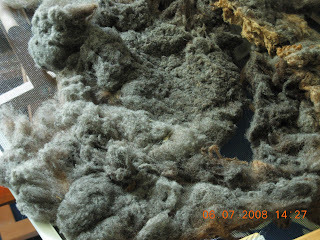 You actually open the ends of each lock separately after you wash the the fleece. It's a little on side of slow going but the resulting spinning fiber and yarn are really nice. Now, I haven't tried spinning this yet and I had to figure out another way to wash the wool than I normally use, but the flicked locks are looking pretty good. These are short; about a 2 inch staple length but I figure that if I can spin cotton, I should be able to handle this. I am washing this fleece for the lock flicking by being very careful to keep larger pieces of the fleece intact and using VERY hot water (hot tap with a kettle full of boiling water added) to the wash pan water and changing the water very quickly -- just as fast as I can boil another kettle of water. The lanolin is coming out nicely and most of the dirt is going with it. It takes one soapy wash and three equally hot rinses to do one small lingere bag of fleece. I'm then hanging the whole bag up outside to drain and partially dry. 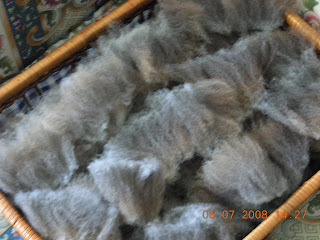 Finally, after a few hours, I bring the bag in, pull the clean fleece out and lay it on the screen to finish drying. Looks like a big moldy sponge, doesn't it? But, so far, this is working well to keep the locks intact so I can flick them out. 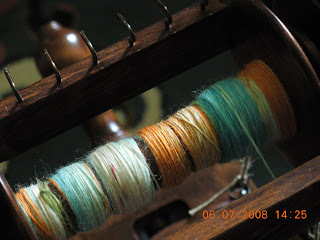 I love, love, love my new Sonata spinning wheel. It is my birthday gift to myself so I have an easily transportable wheel to take on vacations, camping, demonstrations, overnight work travel, etc. I'm delighted with it. But I will make one suggestion for the Kromski folks... the orifice hook hole is inadequate and if you put in the least bit wrong it will either fall out or interfere with the bobbin. So I decided it needed a little bag for the hook and the oil. But the only question was where to put it. The Sonata is a more streamlined design than the Symphony which has lots of pretty bits to hang things off of. So I took the plunge and stuck pushpin into the mother of all and use it as a hook for this. 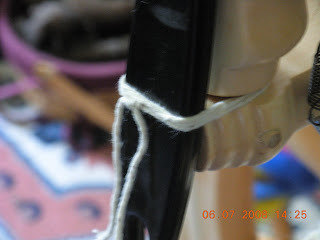 Then I noticed that like my Symphony, I have trouble seeing how the yarn is winding onto the bobbin. It's even more pronounced with the Sonata because the orifice sits at 30 inches to 32 inches while the Symphony is 27 inches. Ken suggested a dental mirror. But I found this. And just to show that all this making do is creating magickal yarn, here is my first bobbin of singles about halfway done. 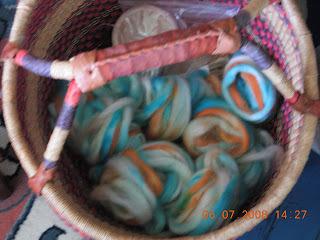 This is hand-dyed corridale that I bought and dyed to teach the kids at Beltane. I didn't get a lot of customers so had some of the fiber left over. I'm going to ply it with solid yellow (as a have a bunch of it left) and there is a yellow theme running throughout the first singles. "The rules of the game get posted at the beginning. Each player answers the questions about themselves. At the end of the post, the player then tags 5 people and posts their names, then goes to their blogs and leaves them a comment, letting them know they’ve been tagged and asking them to read your blog. Let the person who tagged you know when you’ve posted your answer." I had just met Ken and was working as a Correctional Officer at a medium security men's prison. He was a C/O as well and we worked opposite shifts but the same break. Oddly enough we still work opposite shifts... but I'm off on weekends now and he's off ... well, it varies. My kids were still young -- Matt would have been 7 and John was 9. I was waiting for my divorce to finalize. Financially things were really tight. I could not afford to replace my refrigerator (it died) so I had two large coolers on the front porch and kept gallon jugs of water in the deep freezer (a chest freezer) and rotated these ice blocks into the coolers every day. Worked great and my electric bill was down around $75 a month. I had no computers and very few electronics and the TV did not play all day long. Fix the foundation and the roof on my house (and any structural problems found during those fixes), add on to my kitchen, add a large deck off the back of the house, talk the farmer who owns the land surrounding mine to sell me at least five acres of it, fence that in and get some sheep, tear down and replace the shed with a workshop/smithy for my husband, buy the old Women's Club Building in town and use it as my studio and retire. And, if anything is left, I will invest as heavily as I can in a diversified stock portfolio. Of course, if I was really smart, I would invest first and do all the rest as my fortune grew. Intern at the Smithsonian Institute Museum of Technology, Waitress at Vallee's Steakhouse, night manager at Hardee's, delivered newspapers, worked in a plant nursery, intern with the Lutheran Student Movement, office manager/typist/draftsman/proofreader at the School of Engineering and Applied Sciences University of Virginia Grants Department (horrible job), Managing Editor of the Greene County Record, Managing Editor of a small weekly in New Jersey (another horrible job), Managing Editor of the Northumberland Echo, Freelance Writer, Stay-home Mother, Correctional Officer, Correctional Counselor, Probation and Parole Officer. Well, I haven't gotten my check from George W. yet but I am taking the plunge, pulling a little money out of savings and have ordered a Sonata from Bubba's. It should be here sometime this week. 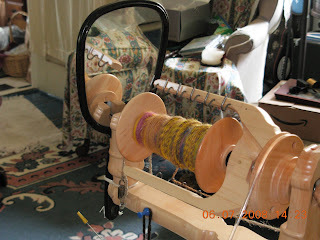 With all this fun activity with my new spinning/weaving friends, I realized during my last outing that loading my precious Symphony in and out of my car is really quite a trick and probably isn't all that good for her. 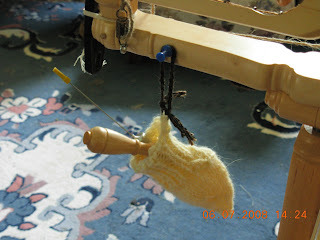 Then, when we went camping over Memorial Day I found myself really wishing for my wheel (I had a spindle with me, but only the one with cotton and while it's a neat trick to spin cotton on a drop spindle, it's not relaxing to me yet). I have folks now asking about spinning lessons and I figure I actually out to get serious about this. Besides, my birthday comes up the end of the month and I'm turning 49! I was traumatized when I turned 45... I just ignored 46, 47 and 48... but at 49 it means that next year I will be subjected to the BLACK decorating and all the other dreadful reminders of getting old. I think it wouldn't be so bad if I wasn't getting reminders in the mail from AARP.